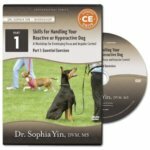 n this 90 minute lecture, Dr. Yin tells the story of how she secretly trained her father’s Cattle Dog puppy, Lucy, for a week before she gave Lucy to him. As a result, her father started off with a polite, focused, well-socialized puppy. Find out how, after only two weeks with her parent, Lucy became and overly-excitable, impulsive puppy who was starting fights with other dogs. See the step-by-step plan that got Lucy back on track so the by 16 weeks she was a dream puppy again. Creating the Perfect Puppy in 7 Days paves a clear path to a happy, long-lasting relationship with your pet. 105 min / 2 units.